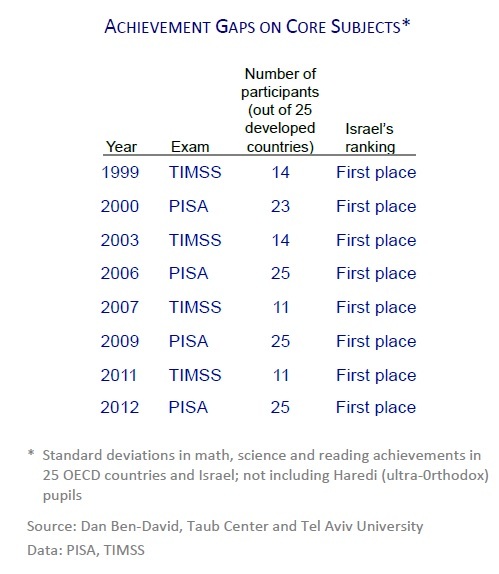 This chapter compares Israel’s education system over the past decade in relation to OECD countries. The achievement levels of Israel’s children are consistently below those of each country in the reference group of 25 OECD countries in nearly all of the years surveyed. Achievement gaps within Israel are wider than in each of the OECD countries in each of the years, while the achievement levels of both the weakest and the strongest pupils are at the bottom – or very close to the bottom – of achievements in the Western world. If, in the past, it was possible to argue that the country’s education system was not short of money, budgeting cuts over the past decade have effectively removed this argument. The chapter concludes with highlights of a proposed systemic educational reform.